Researchers are taking a closer look at juvenile fish survival this summer at Ice Harbor Dam on the lower Snake River. 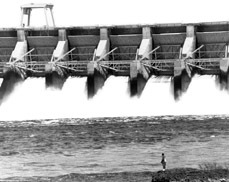 Spill is the dam's main strategy for passing migrating salmon, and biologists have assumed that Ice Harbor's spillway passed fish as successfully as other dams on the lower Snake. But a closer look has found that about 11 percent of the fish die via that route, instead of the 2 percent mortality evident at nearby projects. Combined survival through the bypass and turbine routes at Ice Harbor is estimated at about 94 percent. Tests this spring confirmed the high mortality that was seen last year. Results from a balloon tag study showed fish were injured in both a new spill operation as well as during BiOp spill operation, which calls for about (... incomplete sentence). Test operations began June 24 with alternating two-day blocks of bulk spill and no spill. Huge numbers of fall chinook are migrating out of the Snake compared to previous years with nearly a million sub-yearling migrants estimated by June 27. Federal officials will discuss results of the summer spill evaluation after it’s mid-July completion to decide how best to operate the project through the end of summer. Spring spill operations for fish passage ended June 20 at the other three dams on the Lower Snake. For the rest of the summer, no spill is planned at those projects in order to maximize fish barging efforts, but the BiOp calls for about 75 percent summer spill at Ice Harbor, where barging fish does not take place.